If you need to find out how much space you're using with your hosting account, the best tool to use is the Disk Usage tool in the cPanel. Follow the tutorial below in order to learn about the cPanel disk usage tool and how to use it. When you first log in to your cPanel account you will see all of the applications under cPanel and then to the right you will see a column containing statistics on your cPanel account. You will need look in this column for the cPanel Disk Usage tool. Log in to the cPanel. 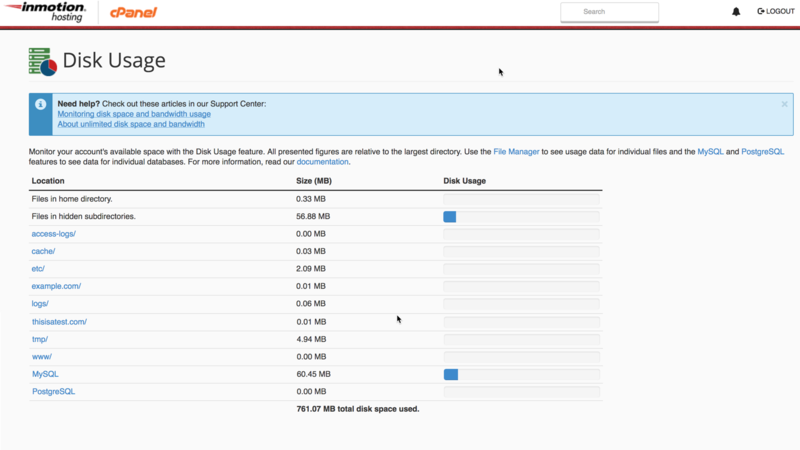 In the right hand column find the option labeled Disk Usage. Click on the link. You will then be in the main Disk Usage screen. You can see a graphical representation of your disk usage in the column at right. The disk usage will be represented by blue bars. Note that this section shows you usage by file name and folder name. The longer the bar the higher the usage. Shared servers don't have a stated limit for disk usage. For more information, please read our article about unlimited disk space and bandwidth. Scroll down and you'll see a breakdown of usage by directories that you can sort by name or disk usage. Use the cPanel Disk tool for a quick understanding of your disk usage on your hosting account. You can then properly plan your backups or your account usage. For more information about the cPanel, please see our cPanel Education Center.